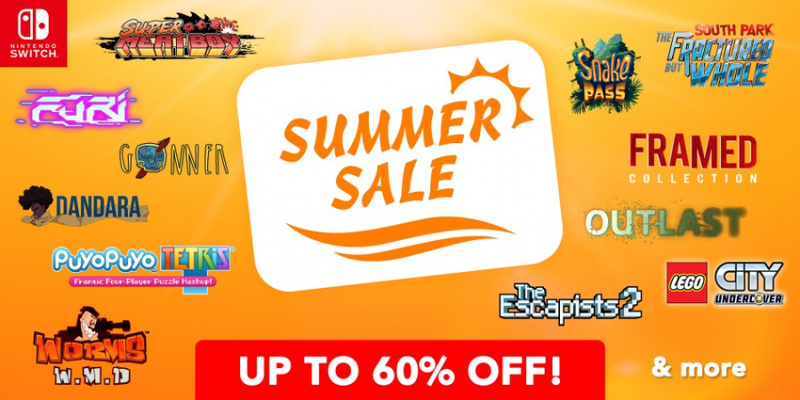 Things are sizzling up right now, especially here in the blistering, relentless summer heat at Nintendo Life Towers in the UK, and to celebrate, the European eShop is hosting a huge summer sale on Switch. A number of games for Nintendo's hybrid console are now on sale with up to 60% off, giving you the chance to mop up any great games you might have missed at very tempting prices. Highlights include games such as Puyo Puyo Tetris, South Park: The Fractured But Whole, LEGO City: Undercover, Just Dance 2018, Rayman Legends: Definitive Edition, Lovers in a Dangerous Spacetime, Resident Evil Revelations 2, Snake Pass, Super Meat Boy, The Escapists 2, and many, many more. You can check out a handful of the offers at the link below, but there are lots more to discover right now on the Switch eShop. Make sure to boot up your console and take a good look through! These offers are set to end on 9th August, but never fear! A whole new selection of discounted titles will become available the next day until 23rd August. If you're looking for some great new games to play over the summer, you're definitely in luck. Let us know if you'll be taking advantage of any of the offers you find in the comments below. Nice. Seems like a good list of games. Hopefully you guys all enjoy it while us Americans are probably gonna get a different and/or later one. The discounts are meh. Majora's Mask deserves a decent sale. This ain't it. Kingdom: New Lands 50% off. Could this get a physical release? I need Super Meat Boy... And Lovers in a Dangerous Spacetime. Was excited for a minute before the link led me to the UK site. Lame. Rayman and Revelations (1&2) here I come. Since Nintendo Life is too lazy to list the games, here's the link of the list from Nintendo Everything. Some great games on offer. Probably gonna pick up a few now that I got a 256 GB micro SD card! @Sinton Didn't they say ages ago we would get the other games in the series "soon"? I'd enjoy a physical bundle, as long as they don't do what Banner Saga guys are doing. May pick up Detention for the spooks. Though wonder what the next batch of games in August will be. @BensonUii Doing what NLdon't.. hm that doesn't have the same ring to it. NL often omit important things like this. @trakkerx In fairness to Nintendoeverything. Bleed and Bleed 2 (plus assortmemt of others) were one sale prior to this. @riChchestM 29% off is more than decent by any reasonable standard. @XenoShaun I wasn’t aware there were more games in the series. I think I’ll wait and see what their plans are, then (hopefully a «real» retail release). @Sinton Limited Run Games just finished taking preorders for this one. @XenoShaun Detention is an amazing game. I highly recommend it. Might buy South Park now. Hope this comes to the us! Gonner is a must by. @Sinton Yeah I think the original was just called Kingdom. And we have a third coming called Kingdom Two Crowns? @jobvd Yes I've seen some gameplay of it, and really encompases asian horror. As always, they only do sales for games people already have or nobody cares for. They should really follow Steam's example and discount (almost) ALL games. I think a lot of these games have been been offered at the same prices previously. No thing's jumping out at me as a new low. Having said that though, I've been waiting for Boxboy to get reduced again so I'll get that. Hopefully the sequel and threequel will go on the same deal when the sale swaps in August. @XenoShaun yes sorry I wasn’t beating on them was just more mentioning they are not on either list but still worth a look. @PanurgeJr Not when 100% is overpriced. @chiefeagle02 so did UK. I got digital copy of splatoon for 20 something pounds. @beazlen1 Very cool! Well, a North American summer sale wouldn't go amiss. My fault for feeding you. Yeah, but no Wii U sales this week. Not even Breakout. Got Gungeons and Draguns for £5.49 today - bargain! And there was me contemplating for a sec to pay full price just last week!!... Good thing I didn't! Wonder what the 2nd batch of discounts will be on the 9th August? Shame it wasn't all at once. If you make a EU-associated account on your Switch, you can access these deals in the US. Hope the batch coming right after interests me a bit more. Picked up Rayman Legends and Furi. Maybe Toki Tori. Has anyone here played The Adventure Pals in co-op? It looks pretty fun but the co-op part is make it or break it for me. Oh and I highly recommend Use Your Words as a party game, €6 is a steal. remember.... you can make a UK account and use it to download via the Euro eShop.... you just need to add funds using a credit card or buy a £ eShop card from a website. @Perryg92 For me the problem with these digital 'sales' on retail releases is the physical copies are still cheaper if you shop around. Indie titles are the only games that benefit us as consumers in these digital sales. On a side note,where is the MHGU demo? The Japanese demo was out long before MHXX was released. Are Capcom intentionally trying to undermine their own game hoping it tanks? Nine parchments inbound. Was eyeing that one for a later date, but won't shed a tear if it ends up a coin cheaper later. Octopath is where most of it is now though. Sine Mora Ex for €11.99 is quite tempting. Puyo Puyo Tetris is amazing. @wariosmith Better off with a Norwegian account. Always much cheaper than the UK eShop and gets the same games and sales. @BionicDodo really???? tell more - do you use € eshop cards? @wariosmith I live in the UK but I just pay on the Norwegian eShop using my UK debit card. My bank charges me about 10p in fees but I often save multiple pounds on each purchase. I am speaking on behalf of everyone here who is too scared to ask the only question required. I downloaded Monster boy today, my first paid Switch download. I heard it was even cheaper before, 10 Euro. Ah well, didn't grab that opportunity. With my golden points it did cost me little over 5 Euro. Not bad!